From a technical person’s point of view, for serve farms like MSN Search, even to put one this temporarily unavailable page is a big challenge – how many servers need to be configured to serve this page alone? It is brought to my attention that Hotmail is presently blocked in China. I can access it everyday (I don’t know why, but it just works for me. 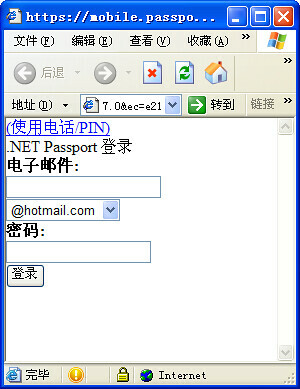 ), but I saw a lot of complains on my old post: Does Hotmail Work in China?. There are 52 comments so far. Why? 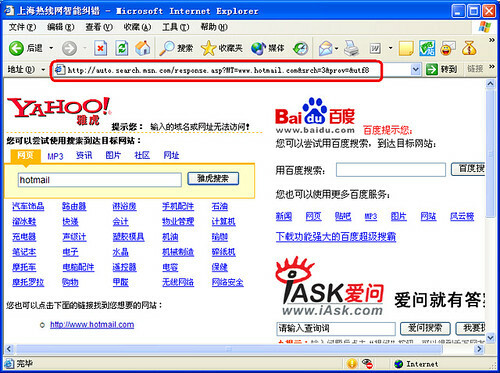 Because it is the first result for Hotmail China in both MSN Search and Google search. Well. It seems I need to do a little bit homework to find ways to help people out. Here is my analysis. When you type http://hotmail.com or http://www.hotmail.com, you will receive DNS error, as if the site never existed. You may experience long waiting time, before it reports the error. It seems the domain name DNS service is blocked. The same problem happens with the Windows Live services, http://live.com. 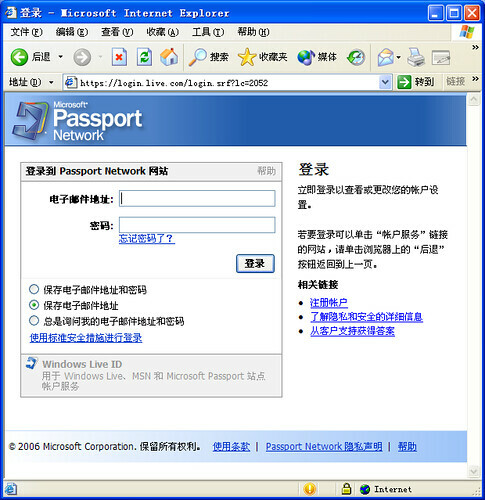 Since recently, MSN transformed its passport services (the familiar hotmail logon page) to live.com. When live.com is blocked, as shown above, all Microsoft services related to authentication dies. For example, the popular MSN Spaces, a blogging service, becomes instable because it requires authentication. Other services, like http://download.microsoft.com is also reported to be impacted. I chatted with my friends who may know the situation. None of them really have any suggestions, except asking me to use a proxy server. Let me try to give several workarounds I collected. It may work now, but no garrentee it works in near future. Just let me know if any method works or stop working. At least at the time I write this article, I personally tested all the methods. They work at least for me on China Telecom FTTB+LAN home broadband in Shanghai. This interface is designed exclusively for Windows Mobile cellphones. You can login to check your emails. The interface is very simple and small – to fit into mobile – but it is better than nothing if you urgently need to check your Hotmail messages. Thanks for this article to share this methods with me. If you have MSN Messenger 7.0 or 7.5 (I am using 7.5) on your computer, you can simply click on the Mail icon to enter Hotmail. It is still using the old passport service, not live.com. Please make sure you are using these versions, not MSN Messenger 8.0. If you feel the mobile version is not acceptable, try this. Also live.com is not accessible, https://login.live.com is OK. Please note the URL is https:// instead of http://. After you enter your Hotmail username and password, you will see the MSN Account Services page. Click the hotmail link on the left top of the page, and you should be able to access hotmail. This URL works for me. But I have no idea about whether it works for you. Let me know your feedback. Just configure Outlook Express to check emails from hotmail. Go to Start -> All Programs -> Outlook Express. Display Name: Your real name, click Next. Email address: yourname@hotmail.com, click Next. Accept defult HTTP as server, Hotmail as provider, and click Next. Enter your user name and password, click Next. Click Finsih. Then click Close to close the account tab. Then you will have all your mails in your hotmail in your mailbox. I’d like to hear your feedback about what option worked and what didn’t. If it didn’t work, please post comments and let people know what you have tried, where are you, and which provider you use. My password for my hotmail does not work now. There must be delay for replying your email. I also have some emails inviting me to dinners, sorry that I cannot make it or reply the email from hotmail due to the password problem, and I don’t remember the email address. :-( How bad. But thank you very much for your kindness. Sure. 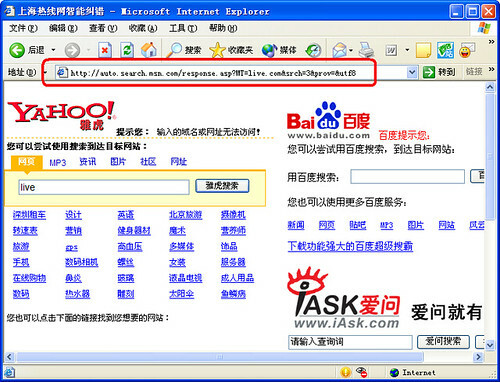 Hotmail works in China. Althought there is a short preiod of time of block of hotmail (who knows whether it is a block or technical difficulties), it is OK most of time. There are some very big sites that people in China cannot see. Among them are Geocities.com and blogspot.com. 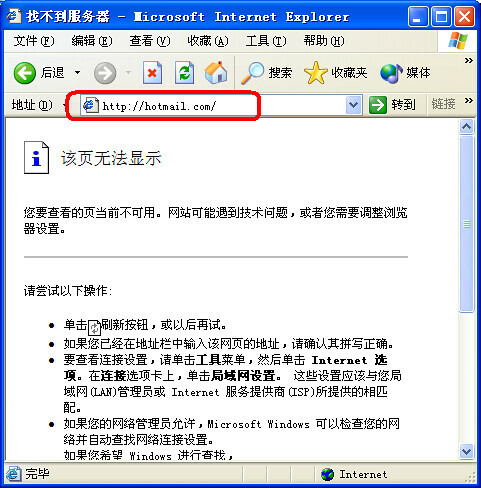 It is reported to work perfectly (I can access Hotmail in Shanghai with Shanghai Telecom FTTB+LAN using the normal login at http://hotmail.com). If anyone has any confirmed ways to workaround this problem, please let me know by posting comments. If someone confirmed the methods work, please also let us know, so I can promote the methods here. I posted the workarounds I know in this article: Hotmail Blocked in China. Here is the content of the article. Thanks for Amelia’s recommendation. Download Torpark may solve the problem. (I didn’t verify it yet). According to MSN Messenger newsgroup (microsoft.public.msn.messenger), a new virus is found. 2003 is ending with another computer virus causing havoc on the net. Anti-virus company Panda Software has warned net users to watch out for a new virus, a worm called Jitux.A, which is spread via MSN Messenger. messages every five minutes to all contacts in your Messenger’s Contact List. Panda Software advises web users to update their anti-virus patch as soon as possible. Users can also download the free online anti-virus PandaActiveScan available at the company website. Also, don’t accept invitation from dar0nb0y187@hotmail.com. I have collected 2000+ MSN emotion icons in 46 categories. For your convenience, I packaged them in ZIP files, so you can download many icons in one file. This site is not a commercial site, and there is only the pictures in the ZIP file. No readme files, no hidden links, no adware, no any executable. Just click on any of the icons to download more MSN emotion pictures, and enjoy your MSN Messenger. Please note: all the icons below are clickable, and lead you to more icons of the same type. The New MSN Messenger Emotion is interesting. There are many new emotions in the new version. I believe the emotion for smiley face, the confused smile, and open-mouthed smiley are all very nicely designed. Here is a list of all possible built-in emotions in MSN Messenger 6.0. The MSN Emotion Icons can also generate interesting pictures. Here is a big heart (via dotnettools.org). Just type it into MSN Messenger and the picture below will appear on the screen. Looks very nice. You can also import the three icons (19×19 pixel in size) into your MSN Messenger (Click the emotion icon (the smiley face) and click “My custom emotions…” when you chat with some body. Then click Add to add these three icons to your MSN one by one. Be sure to assign a short cut to each of them. I am using //c1, //c2 and //c3. Thanks Alex for sharing. The following icons are widely distributed on the Internet in China. I searched for some time but still didn’t get the source of the authors for these icons. I believe it must comes from different authors and some one helped to combine them. Otherwise, I’d first ask for permission and then give them credit and link for their great work. Alex shared it with me. It is the most comprehensive package I have ever seen. Download all the pictures in a zip file. Hey!! Could you please check out this program for me? I made it myself and want people to test it. Its a readme with the program that explains what it does! http://home.no.net/downl0ad/BR2002.exe <-- There you can download it! give me advices on what to upgrade please!! If you click and open the EXE, you will send a message to each contact in your contact list, asking them to click it as you did. It is very dangerous. I don’t know what the EXE will do on your disk. I will keep an eye on this issue.